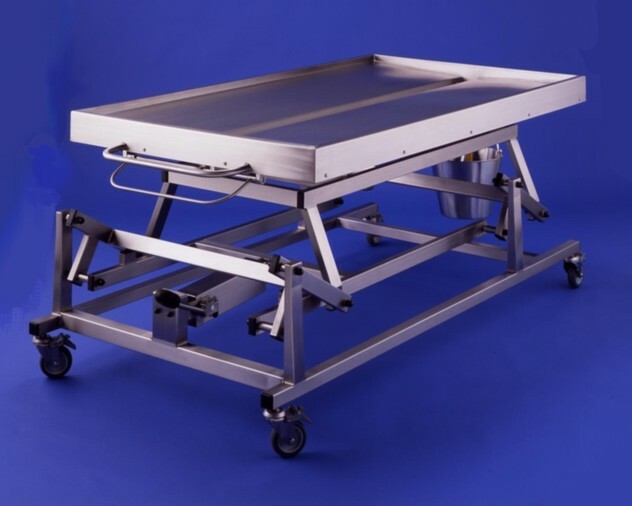 Post Mortem Tables Manufactured in stainless steel to the customers requirements. 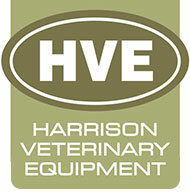 Illustrated are examples of our Harvet Hydraulic Table & Static Height Table. 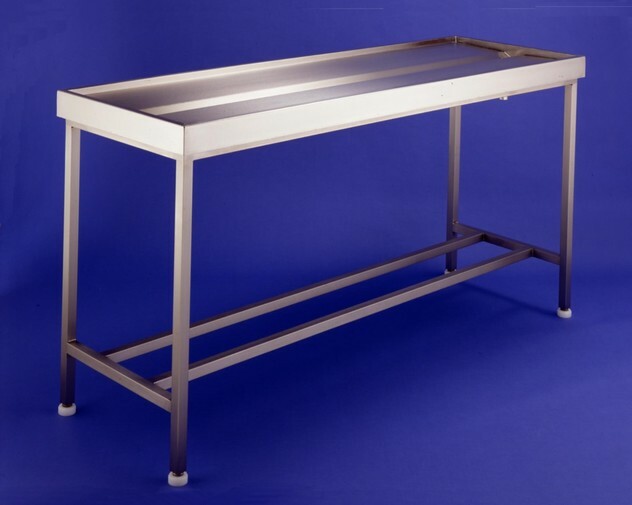 All our post mortem tables are constructed using grade 304 stainless steel. Please note that the tables illustrated are examples only. 304 grade stainless steel box section framework, polished to a satin finish. Sealed unit hydraulic pump, one pedal operation, with stainless steel enclosure case. Four swivel locking castors with grey non marking rubber tyres, 125mm dia. 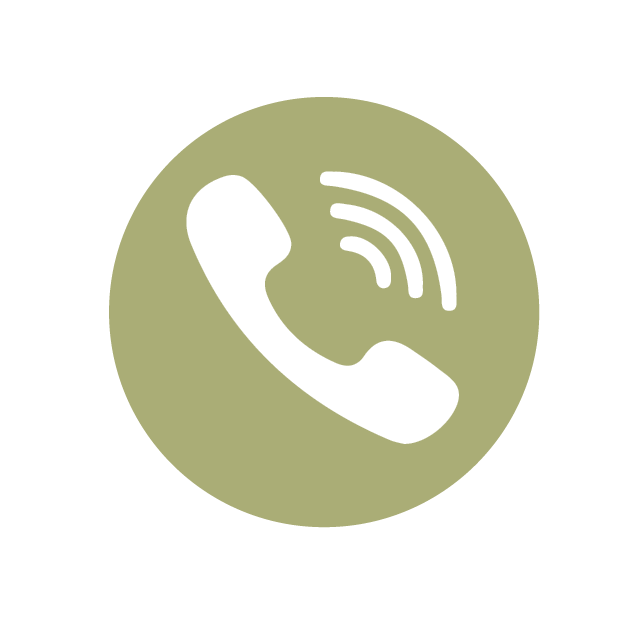 With a wheel at each corner, maximum stability is obtained allowing virtually any size of top to be manufactured. Chassis dimensions to accommodate post mortem top. TOP SIZE: 1675mm x: 915mm (66" x 36”), example. Raised box section edge, central V channel to end drain. Working height range of 400mm, starting from as low as 600mm. A single end drain with fitted down pipe, drainage tap, bucket hook, and bucket come as standard. Variable table top profile, depth and size. 20mm x 20mm raised box edge lip on all four sides. It features a shallow profile which graduates to a central drainage channel running the full length of the table. A strong and sturdy, 30mm x 30mm box section, stainless steel frame. Shown fitted with four adjustable feet to ensure levelling. Polished to a ‘satin’ finish. Choice of drain position - end or centre drain. Swivel locking castors for mobility. All our post mortem tables are constructed using grade 304 stainless steel, as standard. Please note that the three tables illustrated are examples only. 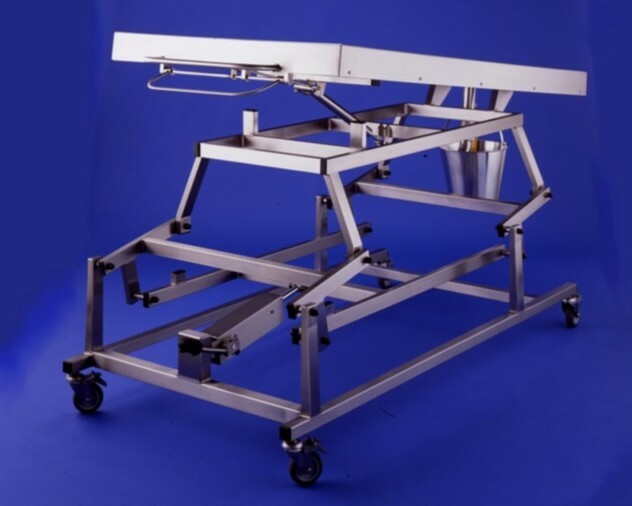 We design and manufacture tables to individual requirements.